Note: If you are totally new to Young Living Essential Oils, you will definitely want to stop by my page, Intro. to Young Living , to learn more! 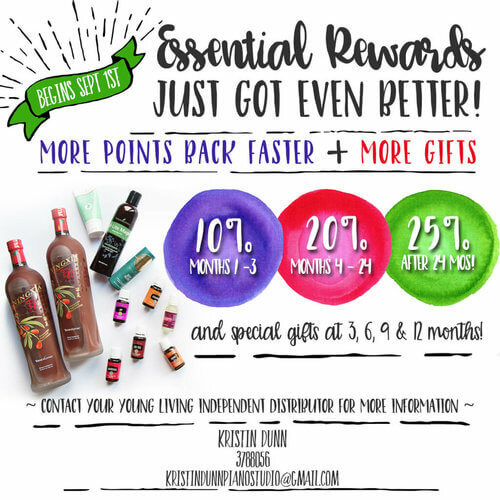 Young Living's Essential Rewards Program allows access to monthly promotions. Participation in ER requires a monthly purchase of 50 PV or more, and the company rewards you for the purchases you make with points to use on free products in the future! Each month you can choose the products you want shipped to your doorstep. If you really enjoy trying different products made by Young Living, ER is for you. One of the things I love about Young Living is that it's not just an essential oil company. They have so many products including personal care, a specialty children's product line, dental care, cleaning products, weight loss and healthy eating, supplements, and even products like a pancake and waffle mix! There is something for everyone, no matter if it's a bag of Thieves lozenges, a tasty pack of Thieves mints, a bottle of peppermint oil, or shampoo for the baby! For the first three months you participate in Essential Rewards, Young Living will offer you 10% of your ER order's PV in free points. For months 4-24, you will earn 20%, and after 24 months you will earn 25%. You will also receive special gifts at months 3, 6, 9, and 12. To enroll in Essential Rewards, wholesale membership is a requirement. If you are a Young Living member, you know members receive a 24% discount on products! Wow! Just log in to your account and click Essential Rewards on the sidebar to enroll. If you decide that ER isn't for you, you can cancel at any time without penalty, but make sure you use those free points first! For more information, click here!